Curtiss Aeroplane and Motor Company was an American aircraft manufacturer that went public in 1916 with Glenn Hammond Curtiss as president. Glenn Curtiss had helped found the Aerial Experimental Association in 1907 and he created the first US aircraft company, Herring-Curtiss Company with Augustus Moore Herring on 20 March 1909, which was renamed the Curtiss Aeroplane Company in 1910. The Curtiss Aeroplane and Motor Company was created 13 January 1916 from the Curtiss Aeroplane Company of Hammondsport, New York and Curtiss Motor Company of Bath, New York. Burgess Company of Marblehead, Massachusetts, became a subsidiary in February 1916. 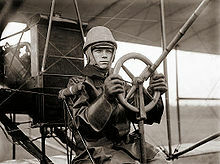 Curtiss started US Naval Aviation by training pilots and providing aircraft. The first major order was for 144 various subtypes of the Model F trainer flying boat. In 1914 Curtiss lured B. Douglas Thomas from Sopwith to design the Model J trainer, which led to the JN-4. With the onset of World War I, military orders rose sharply, and Curtiss needed to expand quickly. In 1916 the company moved its headquarters and most manufacturing activities to Buffalo, New York, where there was far greater access to transportation, manpower, manufacturing, and much needed capital. It became the largest aircraft manufacturer in the world during World War I, employing 18,000 in Buffalo and 3,000 in Hammondsport, New York. Curtiss produced 10,000 aircraft during that war, and more than 100 in a single week. Curtiss Aeroplane and Motor Company is particularly famous for the Curtiss Jenny two-seat biplane. Curtiss worked with the British and Canadian Allies. JN 4s were built in Canada, and many were used as trainers in England. The Curtiss flying boat the HS-2L was used extensively in the war for anti-submarine patrols. Bases were built in Nova Scotia, Canada, France and Portugal for the purpose. The Royal Navy and Curtiss worked together to make flying boats; this culminated with the NC-4, the first aircraft to fly across the Atlantic Ocean, in 1919. On July 5, 1929, Curtiss Aeroplane and Motor Company became part of Curtiss-Wright Corporation, together with 11 other Wright and Curtiss affiliated companies. One of the last projects started by Curtiss Aeroplane was the ambitious Curtiss-Bleecker helicopter, a design that had propellers located mid-point on each of the four large rotors that drove the main rotors. The design, while costly and well engineered, was a total failure. During World War II, as a division of Curtiss-Wright Corporation, Curtiss manufactured over 29,000 aircraft, including 3,000 Curtiss C-46 Commando transport aircraft for the US Army Air Corps/Force, almost 14,000 P-40 fighters, made famous by their use by Claire Chennault's Flying Tigers in China, and later in the war, over 7,000 Helldivers. Bell, Dana, ed. Directory of Airplanes, their Designers and Manufacturers. Washington, DC: Smithsonian Institution, 2002. ISBN 1-85367-490-7. Gunston, Bill. World Encyclopedia of Aircraft Manufacturers. Annapolis: Naval Institute Press, 1993. ISBN 1-55750-939-5. Mondey, David, ed., revised and updated by Michael Taylor. The New Illustrated Encyclopedia of Aircraft. London: Greenwich Editions, 2000. ISBN 0-86288-268-0. Sobel, Robert. The Age of Giant Corporations: A Microeconomic History of American Business, 1914-1970. Westport, Connecticut: Greenwood Press, 1972. ISBN 0-83716-404-4. Curtiss Aeroplane and Motor Company Pictures and Curtiss Aeroplane and Motor Company for Sale.